Place a large pan under a wire rack. (this will catch the leftover sprinkles to reuse.) Lay out a couple of sheets of wax paper. Pour sprinkles in a small bowl, set aside. In a small and narrow bowl, heat wafers along with 1 teaspoon vegetable oil in the microwave, stirring every 30 seconds until completely melted. Tilt bowl and dip half of the pretzel rod down in the melted candy, turning to coat. Using your finger, run along the back of the pretzel to remove excess melted candy, then place on the wire rack. Coat with sprinkles and let sit for a couple of seconds on the rack so that more candy drips off, then remove and run finger along back of pretzel again to smooth out candy coating. Add a few more sprinkles to the back and sides of the pretzel, then place on a clean sheet of wax paper to harden. *Have damp towels handy while dipping pretzels. You will need to wipe the excess melted candy off of your fingers before applying sprinkles. *You will need 1 teaspoon Vegetable Oil for each ½ bag of wafers. What fun! Great project for the grands. Yum! these look delicious! will have to make some with the grandchildren, i'm sure they will enjoy doing this. Those look so good. Perfect for the holidays! Look Yummy! Love this idea, and the fact that they seem pretty easy to make!! I love these, I made some for the first time for my daughters baby shower. I want to make these for Christmas! These would be a great and easy to make addition to my Christmas treat making. These look so festive and lots of fun to make. The kids would love to help me with these! Oh the kids and I need to add this to our list to make! They looks so good! 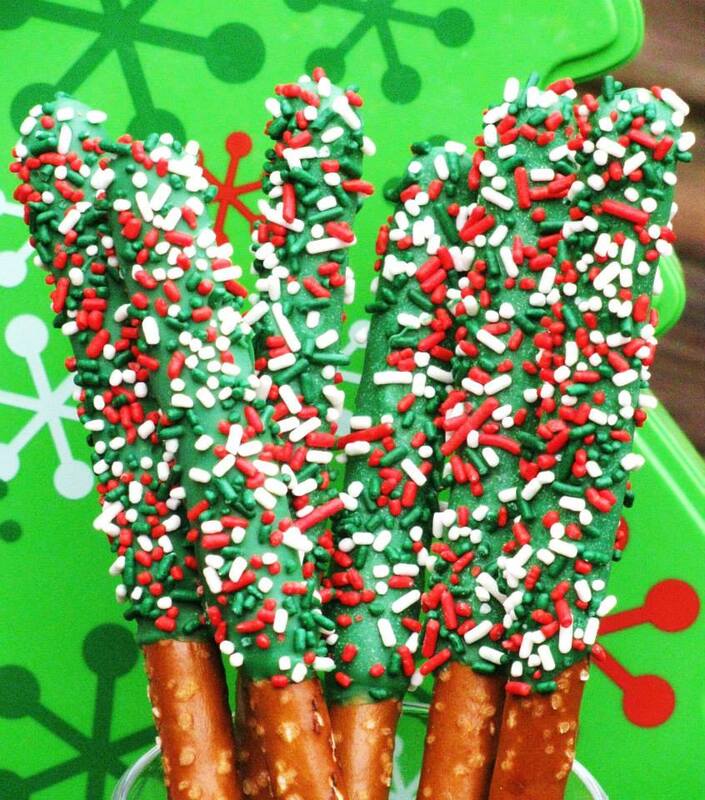 I need to get the stick pretzels. I've made the regular type with the chocolate, but I've always wanted to try making these ones. i love making these! never thought of making them for Christmas though! i my have to get the chocolate melting tomorrow with my kiddos! great gift! I make dipped pretzels every single year. I remember doing it when I was a kid as part of cookie platters. Yours look delicious. This will be a hit! We love pretzels and chocolate! Whoever decided to put chocolate and pretzels together is a genius! 2 delicios treats in one. Chocolate and pretzels. Perfect for treats for a kid's perty or just anytime.